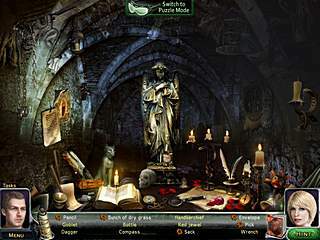 Our Worst Fears: Stained Skin is one of the recently released adventure/hidden object games. 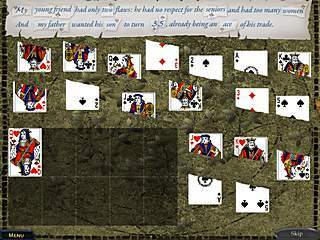 The game has the typical kit for the games of this genre. It involves a mysterious story, inventory searches, hidden object levels, and puzzles. The reality doesn't seem too bright either, and you are even thinking about killing yourself. The game starts with a short premise into the story. You wake up in an unknown location and find a tattoo on your arm. You have no idea neither how you got there nor how the tattoo got on your arm. After a little bit of investigation you are given a pill that takes you back to the reality. The reality doesn't seem too bright either, and you are even thinking about killing yourself. But then you receive the phone call from someone special. She tells you about a doctors suicide and you two rush to investigate what had happened. Soon you see that the tattoo and everything that you find there is connected and can give you the answers to your own questions. The game has everything you would expect from a game of thi sgenre. You will have to walk around different location back and forth looking for the items that you can use in order to proceed. Sometimes you can see a key or something else that is usually required to unlock something, but you can not take it before you come across the need for that object. Then you go back and grab it. 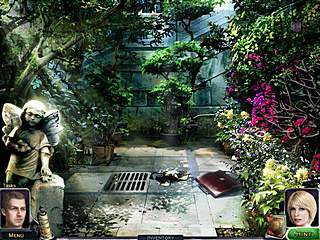 In the hidden object levels, you are given a list of things to find. Most of them are just to be found on a cluttered scene. Some of them though require you to use some other object to fint what you need. The other ones are only found when you use the special goggle mode. There are also different puzzles you stumble upon as you play through the game. They are all typical brain teasers fitting into the game's flow. As to the difficulty levels of the game, it is not too challenging. The casual mode makes it very clear what you are to do. The expert mode is a bit more difficult and might be more interesting for the skilled players. The game keeps any player interested by the way the story is being told. It's not really clear from the very start what is going on. So you get to unroll it as you play. The graphics are beautifully drawn with enough details, and the sounds match the mysterious investigation mood. Me and this atricle, sitting in a tree, L-E-A-R-N-I-N-G! This is Our Worst Fears: Stained Skin review. Download this game here.